As a friend of Amy’s I’ve been waiting expectantly for this book for months. I was not disappointed. I started yesterday afternoon, ready for an evening “get-away.” I read for several hours, though it seemed like minutes. I took a break to watch TV with my husband. Later as he drifted off to sleep, I opened my kindle and began where I had left off. The next time I looked at the clock it was thirty minutes past my bedtime. I put down the book with some hesitation, but knew I needed sleep. 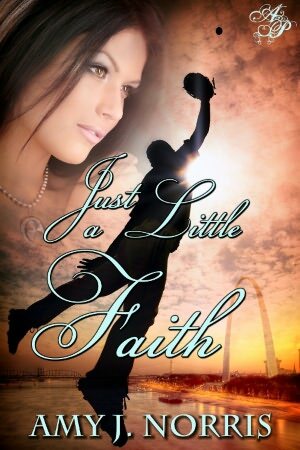 This morning I woke up and looked at the clock–an hour before I needed to get up, but “Just a Little Faith” was on my mind. I couldn’t go back to sleep. I got up and finished this wonderfully written novel before I had to start my day. Now before you think I’m biased, I don’t think I am. Not that much anyway. I know a good book when I read one and this is a good book. I wouldn’t be posting a review if I didn’t think so. I’m not that kind of reviewer. I will tell you about quality stories, and keep silent about the ones I don’t care for–notice I didn’t say they were bad. A good story is in the eye of the reader. 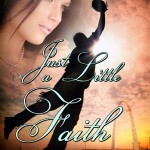 I truly enjoyed “Just a Little Faith.” You don’t have to enjoy sports to get sucked into this book, though one of the main characters is a pro-baseball player. What you do have to enjoy is a strong helping of romance with an inspirational flare. I just know you’re interested now, so click HERE to purchase this book. I, too, loved the book! Just wish it were in print to share with several who don’t do ebooks!